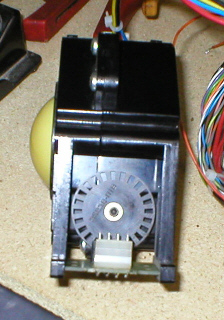 An Atari trackball as used in Centipede, Crystal Castles, Missile Command etc.... is a roller ball enclosed in a housing, that rolls on 3 roller pins which have bearings attatched to their ends. 2 out of the 3 roller pins have have encoding wheels located at one end of the roller, these wheels have small rectangular holes (we'll call them windows) in them. 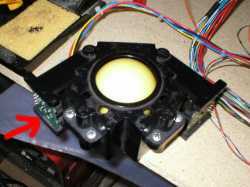 The encoding wheel when in situ rests in a slot in the optical coupler so that it can freely spin. When the wheel is spun, it makes / breaks the optical beam (i.e. ON/OFF) which creates a pulse, which tells the game pcb how fast or slow and in which direction it should move the game sprite. Anyone who has had an Arkanoid or Tempest set up, will already know this, as spinners use just one optical encoder wheel and coupler. Because games like Crystal Castles and Missile Command require the sprite (i.e. Bently Bear or Target cross) to move in all directions instead of just left and right, a trackball uses 2 optical encoder wheels and couplers, 1 for Vertical (up/down) and one for horizontal (left/right). Pictured right is an Atari trackball from a Centipede game, this i am going to use, so that i can convert Crystal castles and Missile Command to Jamma and play them in my 26" Jamma cab. This is how i have the trackball sat in front of me, for co-ordination of layout, with the opto pcb's facing me, so if i mention left hand side (arrow'd) or right hand side, you understand where on the enclosure i am on about. Optical wheels and loom connectors. The Enclosure itself comes in 2 halves, a top part and a bottom part. It is held together with 6 phillips headed screws, simply undo these and the top part of the enclosure can be lifted off. It is now possible to access all the internal components. 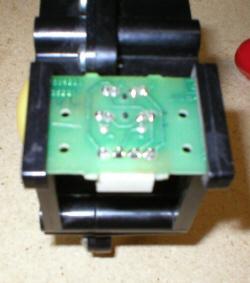 Here i have lifted out the left optical coupler/pcb. Once the optical pcb has been lifted out it can be cleaned, 8 times out of 10 a non working optical coupler is down to it being dirty, as dust and grime builds up on the surface of the optic. I found the best way to clean it, was to use a dry cotton bud and gently rub it in the center slot of the optical coupler. The bearings and rollers are obviously what give the rollerball its smooth action, so if yours is stiff, awkward to move or noisey, then these need to be looked at and either lubricated or replaced. On the bearings themselves i used regular 3 in 1 multi lube, so that they spin nice and smoothly. The rollers themselves may have wear to the middle (where the ball comes in contact) small wear of 1mm to 2mm is o.k. 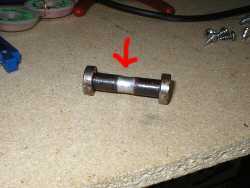 but anything like the roller pictured (arrow shows excess wear) should really be replaced with a new one. 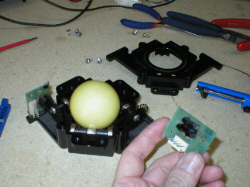 Trackball kits are available from Arcadeshop Amusements in the United states and are nicely priced at $20 for a complete kit of rollers and bearings or you can buy just the rollers for $10. This is a very wise investment as it makes your trackball run silky smooth once again. On the back of the optical pcb's are obviously the soldered joints, these can have cracks or pits in them and not be making a proper circuit. So it pays to reflow these with some fresh solder. 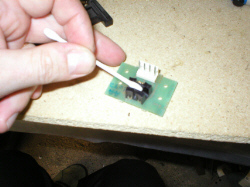 Using a 15 to 18 watt soldering iron and a solder sucker or solder braid, remove the old solder from one pin and then reflow in some fresh solder, do this in turn to all the pins on the optical pcb. Once you have done this to both of the optical pcb's, you are now ready to try out your work by replacing it the game and using it. If you still find after all this that the track ball still doesnt work, you will need to replace either or both of the optical couplers.